Despite positive growth prospects, Survey respondents across the Asia Pacific believe the region faces inherent challenges, including structural economic reforms, effective management of urbanization, and geopolitical conflicts. In recent years much of Asia’s geopolitical tension has been centred upon the South China Sea and on maritime disputes between China and Vietnam, Japan and the Philippines. 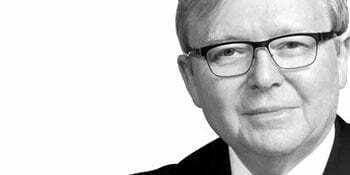 But for Kevin Rudd, former prime minister of Australia, the roots of Asia’s fundamental geopolitical disputes reside in the low degree of cultural and linguistic identification as a community, and in long-standing historical animosities fuelled by unresolved territorial boundaries. Rudd highlights how opposing forces of nationalism and globalization are fuelling deep regional acrimonies in countries that are otherwise interconnected through supply chains. “We need to involve a common concept of community through the wider East Asia-Pacific,” he says. In Rudd’s view, the formation of this community will involve economic, political, security and socio-cultural concepts. Trade propositions such as the Regional Comprehensive Economic Partnership (RCEP) are an important step, as are stronger “effective political mechanisms” within the Asia-Pacific Economic Cooperation (APEC) forum and the ASEAN Regional Forum. Another challenge for Asia will be presented in the rapid growth of cities across the region. There are already 170 cities in China that have populations in excess of 1 million citizens, and the country is forecast to gain 292 million city-dwellers by 2050. Meanwhile, a further 404 million Indians are expected to have migrated to cities. These increases will place a heavy strain on national infrastructure, requiring increased investment in housing, transportation, healthcare and education, among other services. In the long run, Asian economies will also be reshaped by significant demographic shifts. The Asia-Pacific region looms as being the strategic cockpit of the 21st Century, we need more robust institutions than those we have at present. In light of these incoming challenges, Asian countries are reforming their economic structures in a bid to adapt. In 2012, President Shinzo Abe initiated bold reforms in Japan for economic revitalization. Dubbed ‘Abenomics’, the stimulus package focused on monetary, fiscal and growth strategies, but critics argue Japan needs structural reforms for the ambitious economic experiment to succeed. Meanwhile, China’s reform agenda, unveiled at the Communist Party’s Central Committee 2013 meeting, placed clear priority on market forces. President Xi Jinping’s administration is also aiming to boost the role of the national private sector, to encourage the efficient allocation of financial resources to SMEs, and to reduce China’s role in strengthening market prices.